Thoughtful George has a plan. 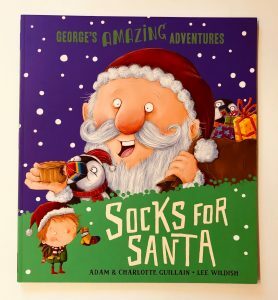 As Santa brings him presents every single year, this Christmas George decides he’s going to take some gifts to Santa instead. He makes himself a sleigh, packs a big box of presents (throwing in some extra woolly socks for himself just in case it gets cold!) and he sets off for the North Pole. However when he gets there he is met by a little elf in despair. They are really behind at wrapping the presents and Rudolph’s nose has stopped glowing because he has flu. George mucks in to help and soon everything is ready for Santa’s journey. He digs in to his box of presents and gives the elves some treats to make them feel better and also finds a torch for Rudolph. However the other reindeer get a little over-excited at the sight of all the presents and soon the big box of gifts George had brought for Santa is empty! 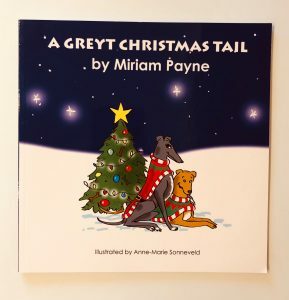 Ramsey and Blue, two rescue dogs, are fast asleep in their beds dreaming of sausages when Santa and his reindeer come crashing down in their back garden. 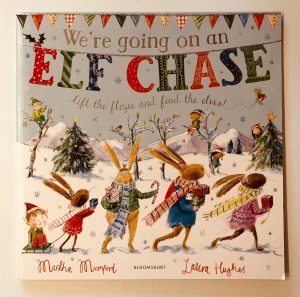 Some of the reindeer have colds and are too ill to pull the sleigh – but Santa still has a whole sack of presents to deliver and he doesn’t know what to do. Fortunately the two dogs have a solution! Ramsey, a lurcher, is super strong and Blue is a retired greyhound who can run really fast. With a sprinkle of magic they leap to the skies and they pull Santa’s sleigh with ease. Soon all of the presents have been safely delivered and grateful Santa asks them to make a wish. Will they ask for more sausages or will they ask for something which benefits dogs less fortunate than themselves? When little Albie goes to the museum with his mum he is expecting the visit to be dull, dull, dull. However the arctic exhibition holds a lot more than just boring old exhibits! Albie tries on a wintry outfit and is just about to start building an igloo out of blocks when BAM a snowflake falls on his nose, followed by a whole flurry of real snow. 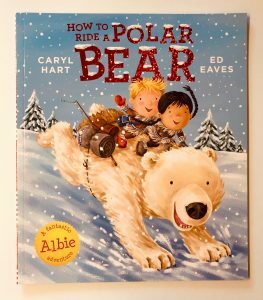 As Albie turns in confusion he sees a polar bear running towards him and realises he has magically entered an arctic world! He befriends a little girl called Yura who is desperately trying to make her way home in the snow. Together they head off on an icy adventure featuring polar bears, an avalanche and some howling wolves. But will Albie be able to help Yura find her way home or will they be lost forever? I’m Natalie, I grew up in Oxfordshire but now call London home with my husband and daughter Matilda (4) and son Jasper (2). I love to travel and have been lucky enough to combine a hobby with my job as a marketing director for the last decade. 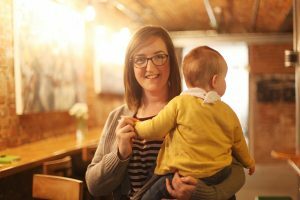 Whilst pregnant with my son I was made redundant, so I now run my own business as a travel consultant where I help families find the best possible option for their trips. 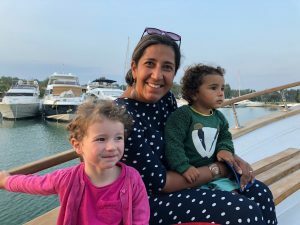 I didn’t want having a family to stop me exploring the world and love helping others when they are planning adventures whilst affording me flexibility to spend time with my children. 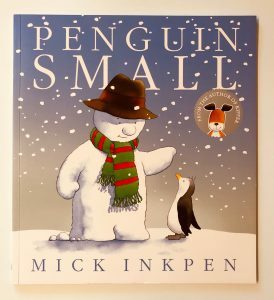 Penguin Small has a lot of fears. He is scared of the nasty polar bears bears who have been playing tricks on him and his friends, he’s scared of water and he’s not a big fan of being on his own. So when all of the other penguins decide enough is enough and head out to sea to make a new life in the South Pole, he is left in an unhappy position. He can’t follow them because he won’t go in the water, but he can’t stay because of the polar bears and the loneliness. What is a little penguin to do? At exactly the right moment a Snowman appears and a series of events result in them floating off to sea on a small piece of ice and discovering a beautiful tropical island. The new friends meets lots of exciting new animals in this weird and wonderful place and the Snowman vows that he will stay there forever. The adorable little snowman in this story is lonely. He sits atop a snowy hill, forever hoping that the little girl who made him will return and play. Little woodland animals come and go. Some nestle awhile in his scarf and hat, others sniff around his feet for nuts and berries, but none of them stay very long. The poor snowman begins to think that he must be very dull indeed if no one wants to stay and be his friend. Then one day he sneezes and accidentally swallows a firefly – and everything changes. The firefly causes his tummy to glow and soon this spectacle draws creatures from far and wide. 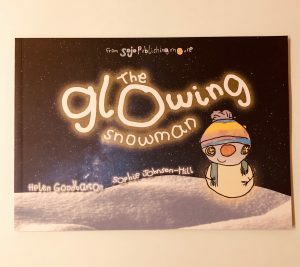 They all want to see the wonder of the glowing snowman! Hi! I’m Lucy. I’m mother to two girls aged 1 and 3, and along with my partner we recently moved from central Manchester to a lovely rural market town in Cheshire to be nearer family as the kids grow up. After having my first baby in 2015 I launched my coaching business Brand New Mum. I now work supporting women who are either starting or growing creative, independent businesses after having children. 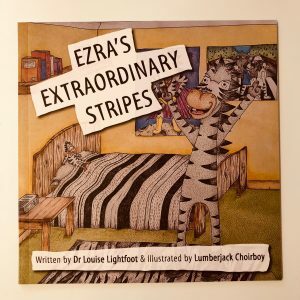 Ezra is a zebra who doesn’t want to be a zebra anymore. He is sore and tired and he doesn’t know any other zebras so he feels lonely too. Instead he wants to be a racehorse because they are big and strong. One day Ezra comes up with a plan. He paints himself so that his stripes disappear and he looks just like a regular horse. He walks around town and nobody recognises him or notices him. This is just what he has always wanted – not to stand out – but he soon realises that being just like everyone else doesn’t make him happy either. He sits down with his friend Lindsay the llama and he tells her exactly how he feels. Wise Lindsay explains that the things that make him different are the things which make him special. People love him just the way he is and although it might be tough sometime he should wear his zebra stripes with pride. Everyone knows what lions are like. They’re big and fierce and they love to chomp on any animals which come their way. Right? Well what if that that’s not the case? What if that’s just a stereotype and all lions are individuals, just like people? Meet Leonard. 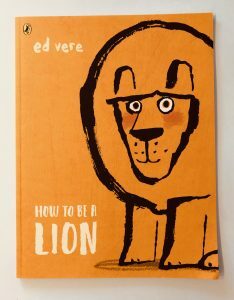 Leonard is a lion and he’s not fierce at all (except when he’s protecting his friends). He likes poetry, thinking important thoughts and having long intelligent conversations with his pal, Marianne the duck. When Leonard and Marianne chance upon a pack of other lions they are mocked and ridiculed. These lions thinks that Leonard is no lion at all. Real lions would have eaten the duck and they certainly wouldn’t sit around watching shooting stars and talking about the universe.